Songs and Dances from Shakespeare. A Saydisc CD by The Broadside Band, Jeremy Barlow, director, accompanied by a Dolmetsch Historical Dance Society booklet. Considered to be more danceable than most commercially available Elizabethan period music. Has the usual "Full Fathom Five" and "It was a Lover and his Lass" and sample corantos, galliards, and other dance music. Identifies music and songs actually used by Shakespeare and pieces included to illustrate music Shakespeare mentions. One of the Society's Journals has a transcription by David Wilson of the so-called 'Inns of Court' manuscripts. Book and cassette available from: Diana Cruickshank, Hunter's Moon, Orcheston, Salisbury, Wiltshire, SP3 4RP, UK. Tel/Fax: 019180 620339. Playford also contains marginally suitable dances, especially when danced with pavan-style doubles. The Body Embarrassed. Shakespeare Studies 25 (1997): 290. 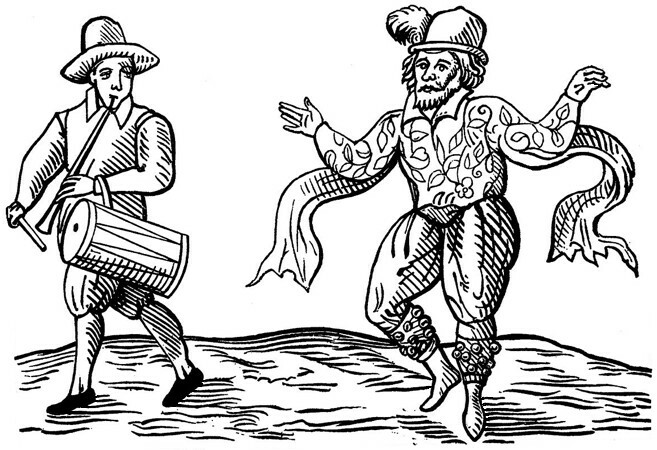 Plays in Shakespeare's time were often followed by yet more entertainment, usually comic, that included dancing. See: Will Kemp. While relatively few plays included actual dances, a great many of them would have been followed by theatrical dancing. Shakespeare and the Dance. Ingrid Brainard, in the Dolmetsch manual on dances of Shakespeare's time. The songs and music are of the time, not of the plays. Shakespeare and Music. Edward Naylor (1896). As for the content, Brissenden examines how dance functions as a plot device and how Shakespeare uses dance references within the plays. While Brissenden gives no choreographies  just the names of suggested dances for fifteen of the plays, he does provide a concise history of Renaissance court dance and an explanation of how dance was viewed by the Elizabethans (a lot of Arbeau and Sir John Davies' "Orchestra"). He discusses specific dance references and suggests general themes for the dancing in the different genres of tragedy, comedy, etc. There is also a glossary of common dance terms and a substantial bibliography. I am less qualified than many people to vouch for the validity or accuracy of Brissenden's observations, but I do know that Stephen Orgel, Shakespeare scholar and court masque expert, takes issue with several of them (unfortunately, he didn't specify which ones during our conversation). Ingrid Brainard also contests some of the aforementioned dance suggestions. Still, this text is a good place to start an inquiry into dance in Shakespeare and is frequently referenced. Just don't be afraid to diverge from Brissenden's interpretations if your own research leads you in a different direction. Fertile Visions: Jacobean Revels and the Erotics of Occasion. Studies in English Literature 39.2 (1999) 327. Bodies of the Text: Dance as Theory, Literature as Dance. Goellner, Ellen, and Jacqueline Shea Murphy eds. True Rites and Maimed Rites. Woodbridge, Linda and Edward Berry eds. As You Like It  mentions Pavane and Galliard. Hamlet  contains mention of Jig, Pavane and Galliard. Love's Labour's Lost, III, i, 9  Moth: "Master, will you win your love with a French Brawl?" Armando: "How meanes thou? brawling in French?" Moth: "No, my complete master; but to jig off a tune at the tongue's end, canary to it with your feet, . . . sigh a note and sing a note." Much Ado About Nothing  "The first suit is hot and hasty, like Scotch jig, and full as fantastical; the wedding, mannerly modest as a measure, full of state and acientry; and then comes repentance, and, with his bad legs, falls into the cinque-pace faster and faster, till he sinks into his grave". The Twelfth Night, III.  Sir Toby suggests that Sir Andrew dance Caranto and Jig. Pavane and Galliard (or cinquepace) also mentioned. Another appropriate dance might be the Caper. One might teach Sir Andrew Aguecheek a deliberately bad galliard step. Il Ballarin: The Art of Renaissance Dance.  (Videotape). Sutton, Julia, 1990. Distributed by Dance Horizons Video, Princeton Book Company, Publishers, Box 57, Pennington, NJ 08534. Individual steps from the treatises of Fabritio Caroso and Cesare Negri, and group dances (in costume) to period instruments. Brissenden, Alan. Shakespeare and the Dance.  ? : N.J.: Humanities Press, 1981. Discusses the role of dance in Shakespeare and gives suggestions for dances. Buckley, Reginald R. The Shakespeare revival and the Stratford-upon-Avon movement &150; With chapters on folk art by [Mary Neal], a forward by F.R. Benson, and an introduction by Arthur Hutchinson. London: Allen, 1911. Graham, John. 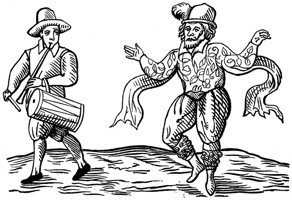 Shakespearean-Bidford Morris Dances  Curwen Edition 5623. London: Curwen. Kimmins, Mrs. G. T. Songs from the plays of William Shakespeare  With dances as sung and danced by the Bermondsey guild of Play, with incidental music, photographs arranged and taken by Miss Ruth Gardner; the dances arranged by Mrs. Woolnoth; the costume designed by Miss Alice Rennie; the pianoforte accompaniments by Mr. Richard Chanter. London: Novello, 1911.